The Nordic running in Rose Bay, Sydney Harbour during November 2008. 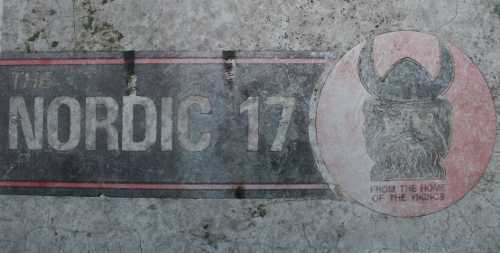 The boat was sold as a 'Nordic 17' which as the name suggests, is a 17" boat (approx 5 metres). The hull is fully fibreglass , thus despite the lapstrake look, it's a fake. The hull is pointed at both ends and has clean lines in the water. It also has a full length keel and is ballasted with concrete to aid stability in rough conditions. The keel also protects the prop - the rudder's bottom bracket runs UNDER the prop, thus the prop is protected from running aground. A number of people have suggested that with the addition of a mast, it might actually sail reasonably well due to the keel and balast. The boat and the engine were in poor condition. Dad got the engine refurbished by Aub Rose, a Sydney 'identity' in the old marine engine world, So after a rebuild by Aub we had a perfectly functioning TXRR engine. 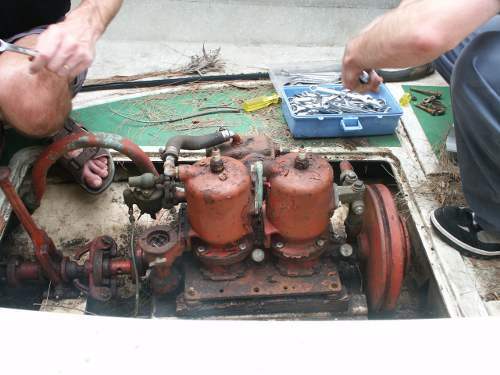 At this point, when Dad tried to refit the engine to the boat, it was realized it was not going to work. The wooden hull had been glassed over and had suffered extensive rot. A number of ill though out modifications had been tried to the prop shaft that prevented the clutch from working. So with a newly refurbished Blaxland TXRR and no boat to put it in, Dad when out a bought a new hull to put it in - a Nordic 17 Half Cabin 'launch' - it was of similar size and power requirements to the original boat. The engine was duly fitted and the boat moored in the bay below our house. There it lived for a number of years being used by my father for fishing and myself and siblings for 'puttering around' the Port Hacking and swimming. (I was never a fisher). In April 2006 my father passed away, while it was always my dream to get the boat back, waiting for my father to pass away was not 'part of the plan'. My siblings certainly didn't want the wreck that was in the back yard, so it was mine. My brother had even suggested 'just torch it' :-). 18 years in the open hadn't been kind to it. Small trees had grown up around the trailer, the cabin and much of hull was covered in Lichen, the deck covered in leaves. Mulch had formed on the deck and over the engine and plants were growing in it. The engine cover had rotted and collapsed, so the engine was surrounded by dirt. First order of business was to get the boat moved - the house was to be sold. I was rapidly determined that the old trailer would never run on the road again. I'm surprised it didn't simply collapse when I used a winch to pull the trailer out of the corner it has so much rust. (There was no way we could get a car in to tow it out, so using a winch and convient trees, the trailer was pulled out and turned around.) Surprisingly however the tyres still held air and I noticed when we dragged the boat off the suspension still worked! So the boat and the trailer were measured and detailed photographs taken and the measurements and photos sent to a couple of trailer builders. Eventually I selected Sales Trailers in Peakhurst to build me a tandem axle trailer rated at 2000kg. This may be excessive, but I was unsure what the boat actually weighed. (Subsquently determined to be 755kg, so yes, I over did the trailer rating). The Blaxland was looking pretty sad - and it would appear was never flushed out - when I removed the exhaust elbow, it was full of red powder. With the help of a couple of friends the engine was lifted out and taken down to Aub Rose's workshop in Kirawwee, who after 27 years was still in the same workshop, with the same phone number (with the addition of an extra digit due changes in the phone network). Aub was 'semi' retired at this point, but still rebuilding Blaxland engines as a 'hobby'. (Aub passed away mid 2008, the vintage engine world, and in particular Blaxland fans have lost a real asset in Aub, he was always ready to chat about Blaxlands and his work on them). I think Aub was a little horrified at what we had done to 'his' engine. Aub subsequently told me he was having trouble getting any of the bolts out and the magneto was beyond help. I 'wrote' off the Blaxland and left it with Aub. I don't know if he ever got it apart again. The Blaxland was declared a write off early 2007. Thus the hunt for a new engine started. This sort of makes the project a bit like My Grandfathers Axe, as the hull was purchased for the now written off engine! Since the boat required such a low amount of power, I figured Electric might be possible. I discovered the Electric Boat mailing list. (http://groups.yahoo.com/group/electricboats/). I also hunted around for some one who built electric boats in Sydney. I found http://www.solarboat.com.au/ and the owner even came out to my place and had a look, but he never got back with a formal quote - only a 'off the top of my head' figure while he was looking. (Turns out he got a large high profile contract to supply electric boats to the Singapore Government, far more profitable than re-powering old boats!). In parallel I was also looking at ICE options. In the end it came down to a Bukh DV7 ME. Nothing else on the market was small enough, and I didn't want a 2nd hand 'vintage' engine, as I really didn't want the maintenance involved in keeping such an engine. Despite Bukh's advertising saying their engines are 'finely balanced', I saw several posts around the 'net claiming the DV7 vibrated a lot. Being a single cylinder engine balance would be a problem. This made electric even more attractive. In the end with the help Andrew Gilchrist from fastelectrics, I designed my own system - A Perm 132 motor connected directly to the prop shaft running at approx 30 volts would develop similar RPM to the old Blaxland with out a reduction gear and the power the motor could deliver at that voltage was more than sufficient and the calculated current of ~60A was below the continuous rating for the motor. Hence unlike many e-boat conversions I don't need a reduction gear/pully system. I'm a mechanical klutz, so wanted some one else to do the mechanicals. Based on a suggestion, I spoke to a boat builder who is based near Wiseman's Ferry, north of Sydney, who while had no e-boat experience, was well experienced in low friction drive systems - he builds Hydroplanes for his son to race. Serious racing and speeds where any drive friction leads to rapid failure. While on a overseas trip during 2008, Graham the boat builder fabricated a new low friction stern gland and fabricated and installed all the required mounting hardware for the shaft and motor. Note that the chain you can just see behind the motor is not a chain drive, but a double-width chain acting as a coupling between two idential cogs. By mid October 2008, I had a mechanically complete system. The external condition of the hull was not good - years of exposure had made the gel coat porous and the lichens had started to colonize it. The underside was also scratched where my late father had used a orbital sander to remove the anti-fouling paint. Some of the old anti-fouling still remained. A pressure cleaner removed most of the surface lichen but it was in the surface not just on it. After looking at the chemicals involved, I rapidly decided this was a job for a 'pro'. Now it was Mid October 2008. It was a year and half since I got the boat and started to restore it. My work was having it's Christmas party on Shark Island in Sydney Harbour on the 30th of November. 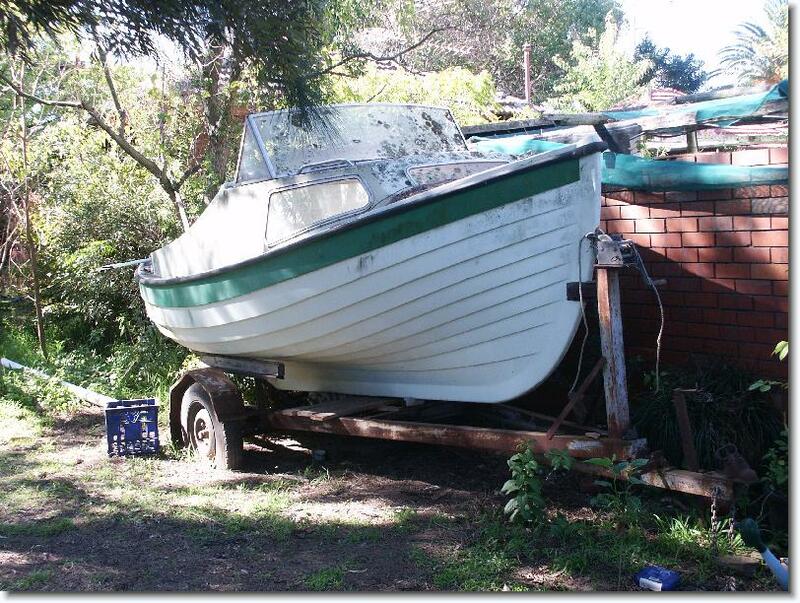 I made having the boat operable on the 30th of November my key goal. At this point I didn't have batteries, a charger or contactors. I decided that something like Trojan flooded lead-acid would do me fine and had a good reputation, so I found a local dealer (Alco Battery Sales) and ordered 6 x T145 batteries. I also ordered a Delta-Q charger from them. Alco delivered very quickly. No one in Australia seemed to sell 36v contactors, but I eventually discovered Kelly Controls and ordered on-line. Kelly Controls is in fact a Chinese company and the contactors were shipped direct from China. At the same time I ordered some lengths of 4 gauge cable , connectors and tools from an electric vehicle supplier in Western Australia, Zero Emission Vehicles Australia.. The contactors from China arrived first! The Perm motors are lower inductance motors, make sure you have at least 4-5 feet of wires, don't make them too short or you could cause issues. Keep the wire together going to and from the motor. A diagram is attached for AXE with Perm motors. Controller throttle ramp rates not more than 7. Suggest throttle up 5 and throttle down 2. A number of weekends of frantic assembling then ensued. I mounted the controller and the contactors on a sheet of marine ply that would span the old engine bay. I cut up the 4 gauge cable into appropriate lengths and crimped the cables. I also had some timber work to do - we fitted a seat in the stern area for the operator all those years ago - it was a solid lump of wood, which had of course rotted. So had the engine bay cover. I made up replacements, and these had to be sanded and painted/varnished. I ignored the windows. The original rudder was also not very serviceable, having been eaten by sea worms and then warped over the years. Basically most of the timber on the boat was in poor condition. After several weekends frantic work, it was ready to test 'live'. I don't actually own a car - all the moves mentioned were with a hired Hilux truck. My local hire place also has 4 wheel drive versions, so on 13/11/2008, armed with a 4WD Hilux, my wife and I set off to do a 'sea trial'. I had planned on using the quiet Kogarah Bay, however when we got down there, I discovered that at low tide the ramp and the end of the bay is unusable unless you have a light boat and are prepared to drive on sand. The Nordic is heavy. So I then decided on a ramp at Kyeemagh, next to Sydney Airport. I knew it ran into deep water, so off we went. When we arrived, I discovered that my unsecured batteries had been moving around. After pushing them all back into position, doing a last minute systems check, I screwed the bung in and started to back down the ramp. At 13:39 the boat floated free of the trailer and for the first time in nearly 20 years she was afloat. One 'useful' side effect of using the 4WD truck is that they are very high - so I can back the trailer in deep while keeping the truck dry. The Nordic has a deep keel and is ballasted with concrete, so leaving the trailer dry and pushing the boat off like many people do with their boats isn't going to work. The electric motor performed even better than expected, up to a nice cruising speed the boat was only pulling 30-40amps from the batteries and the throttle was still only at 50%. Any more throttle and the current went up fast, the boat started to pull a wave behind it, but very little extra speed was obtained. At this point my only instruments were an old laptop running Altrax's controller configuration software. It's screen is quite hard to see in bright daylight. After an hour of cruising around the area near the boat ramp and taking photos, we recovered the boat. Of note this was the first time ever my wife had been involved in anything like launching or recovering a boat. My last experience was 18 years earlier, with my father. But despite the rising wind we got it back on the trailer, I tied the batteries down this time and we returned home, with a successful 'sea trial' completed. Based on the performance during the trial, I programmed the Alltrax to limit the throttle to 60%. I probably could have gone 24v based on this live test. The boat worked well, although we didn't go all that far - Rose Bay to Shark Island, a loop around Clark Island and back, then a 2nd loop of Shark Island for colleagues who wanted a ride. Failed to collect any run data with the laptop. The screen is very hard to see in the sun and I totally failed to get it to log controller status data. Still the only instruments were the laptop. Subsequent measurements of the battery terminal voltage seem to indicate we only used approx 20% of the battery capacity that day. It was also the first time I had operated a boat on Sydney Harbour. It was a little scary heading out into Rose Bay and have a sea-plane wizz past on one side landing and then another wizz past on it's take off run on the other side moments later. I needed something better than a laptop as instruments. After searching around it appears the best to get was a Xantrex LinkPro. Turns out this is a re-badged TBS ExpertPro. TBS are an OEM only, and would not sell direct. Their Australian agent is EV Power Australia. I found another Aussie vendor 'Energy Matters', a vendor for solar power systems, but they were more expensive. I have a 36v system, The Expert-Lite was only rated to 35v and did not support pre-scalers, so I had to go with the Expert-Pro and a 1:5 pre-scaler, even though none of the other extra features of the 'Pro' model I would be using. TBS are working on 'HV' versions of these monitors (up to 72v with out a pre-scaler) , but they won't be available for some months. So I ordered TBS Expert Pro and a 1:5 pre-scaler just before Christmas. This package rapidly arrived from Western Australia. I connected up the Expert Pro and gaff taped it into position as I wasn't really sure where it should go yet. Then I discovered that I can't get it to 'auto synchronize' with my battery/charger combo as I don't know the float voltage of the charger - the Delta-Q actually turns off when it reaches full charge and then monitors before giving a periodic boost, so I haven't yet managed to measure it's float voltage/current. The TBS will only go down to 40v for that setting though. (I'm hoping TBS and/or Delta-Q respond to my request for further info on how to handle this). On interesting point is that Trojan give a C5 rating for their batteries as well as the more traditional C20. The TBS allows the C5 rating to be input - giving a far closer match between stated design capacity and the real use they get. The boat got another outing on the 3rd of January 2009 - on Port Hacking, my old 'sailing' ground. The TBS was measuring current fine, but the Ah used was not working. It dawned on while bashing about up the end of South West Arm that the sense wires to the shunt were probably reversed. I swapped them around and it started to count Ah used and began to estimate 'run time remaining'. Again I failed to log any data from the controller. This time I think I got it logging but the lid fell shut on the laptop when I stowed it under the seat and it went into hibernate. Feb09 - I finally worked out what was happening with the logger - the program stops when the controller is stopped - the way I have the reversing wired, the Alltrax controller is disconnected entirely when the control switch is in the 'neutral' position - as per Alltrax wiring diagrams. The logger stops when the data flow from the controller stops, and doesn't automatically restart when the controller is turned back on again. However during one of our Port Stephens adventures the old laptop I was using failed - it's hard disk apparently didn't like the battering we got and gave up. I'm not taking my new work laptop out on the boat - an accident would be too difficult to explain to the boss! Something not mentioned yet is how to get home if I run the batteries down. In Late November 2008, Honda had a special on the EU series of portable generators. I bought my self a EU20i on special. These Honda generators have a pretty good reputation. The vendor (The Generator Place) has a show room in Peakhurst, near where I live, I went over and went through what I wanted one for. (Charging batteries), they also went through with me how to 'store' the generator over the winter months when I was unlikely to use it. (Drain the fuel tank and carby to stop the fuel going off and blocking the fuel lines and store it 'dry'). 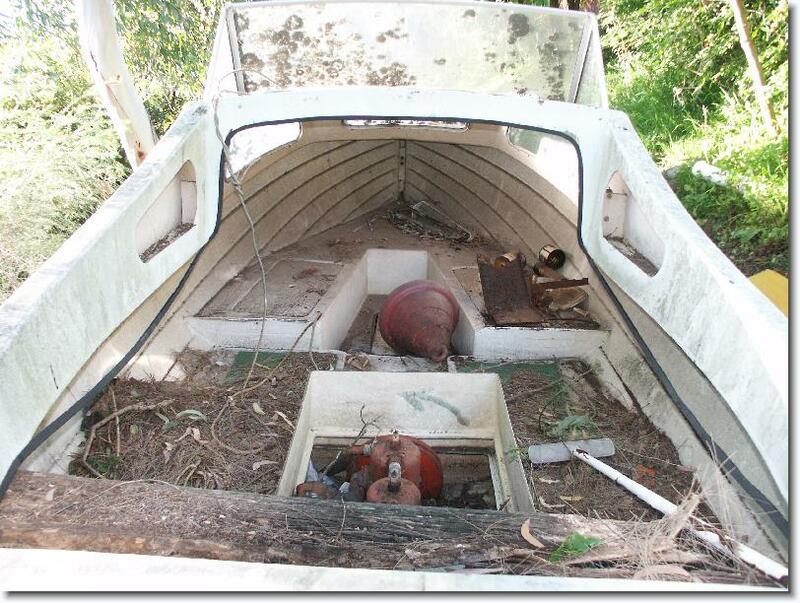 The generator was tested under load on the 1st of Feburary 2009 with an outing on the Lower Myall River. Up in the quieter reaches on the river, I lashed the generator to the roof and ran for a while at 20A draw - i.e. all power was comming from the generator and not from the battery bank. It would appear I get about 3/4 speed with 20A. It's noisy though!. This roof arrangement is only suitable for quiet waters as the generator has no protection from splashes or spray at all up there. On a subsquent trip across Port Stephens from Winda Woppa to Lemon Tree Passage (30km round trip) the generator was used twice at anchor to boost the battery charge - I put a little in to the batteries while stopped at Lemon Tree passage while we ate lunch, but we got caught with a strong head wind and a lot of chop on the way back. While we probably could have made it back with out the generator, I didn't want to risk it, so we pulled into a sheltered bay and put 20A/hr back into the batteries. The chop/swell was splashing over the side, no way the generator could be run underway in those conditions with out it being damaged. The boat ready for a trip out on the Myall River, in Feburary 2009. Note how it has changed from the picture at the top of this page, taken back in 2006 before it was fully cleaned out of leaf litter and moved from my father's place. It is still not finished of course, the batteries are not fully boxed in, the wires still run across the deck instead of under it, and the tiller is a tomato stake - the rag wrapped around it is to stop the tiller from scratching the fibreglass. One window is still missing as well, but it is a fully functional electric boat and about to go out across Port Stephens. Getting accurate speeds is difficult - while I read them of my GPS, the actual 'air speed' is difficult due to winds and currents. GPS is telling you the 'ground speed' only. The low current run times should probably be taken with 'a grain of salt' as the short periods of run at that current means the readings will not have stablised out yet. The high current draw run times will be more accurate. The run time is to 25% rated (C5) capacity of the batteries. 20A is highlighted as that is the output of my charger, using the Honda gen set, this speed can be kept as long as the fuel lasts. It's worth noting that a significant portion of my maximum speed has already been reached by this point. To assist with centring the boat on the trailer, I bought two of those 'self centring' keel rollers , the type with the spiral track on them. It's rather difficult to change rollers while the boat is sitting on them!. I managed to get one on, then realised I'd fitted it the wrong way around!. On the 15th we took the boat up to Bobbin Head and launched at Apple Tree Bay. I took some family out for 2 hours, then came back and some friends had a ride. While the boat was off the trailer I took the oportunity to fit the other self centring roller and turn the first one the right way around. A lot easier to do with the boat off. The rollers did make recovery easier - the boat came right up the centre line. I decided to try a different location for the batteries. When hit 'broadside' by wash from other boats, the rocking was more pronounced than I remembered. It also rather upset my wife, who really didn't like the sideways rocking at all. So I did some measurements and saw that I could actually fit more batteries in the old engine compartment, so I moved two of them into the compartment from the boxes on the side. The arrangement of the batteries is now - Traction wiring still runs across the deck - I will have to pull the engine compartment sides off to be able to get a drill under the floor to drill some extra holds through the sub floor bulk heads, and that will require me to remove all the control wiring (it's attached to the compartment sides). Some might have noticed that this page hasn't been updated for a while - that's cause 'it all just works'. Over the winter months, I removed the controller and motor so I could keep them dry indoors. For the this season two electrical things done was to relocate the exposed battery wires under the deck and to replace the timber the controller and contactors were mounted on with an aluminum plate. I also bought a kw/hr meter and i'm keeping a record of power fed in. If any one's interested , drop me a line and i'll link you to the google docs spreadsheet. With my boat well and truly 'stored' for the winter, and the Winter Solstice just passed, I totalled the power used by my boat over the last season. The boat was used only 8 times over the summer. So ⅓ of the power my boat consumed from the 'grid' was used solely to replenish what simply leaked out of the batteries. However the total cost of that electricity was in the $10 region. Each time the boat was used it cost around $12 in diesel fuel for the 4wd used to tow it from my house to the boat ramp. This season had been going well, till our Holiday in Feburary - i'd taken the boat to Hawks Nest on Port Stephens for some Myall River cruising. It was not to be. On the first outing, (with my mother) the Alltrax motor controller failed. After getting it of the trailer and around to the jetty, parking the trailer, etc, when I went to depart the jetty the motor ran up to full speed the moment I flicked the direction switch. The sudden turn of speed caused us to hit a marker pole a little hard, but fortunately no damage. After drifting in the river a bit, and swapping my 'control' box over to a spare, I decided i'd better return to the shore - using bursts of full power I beached the boat next to the ramp. The Alltrax was showing an error code - but when I tried to lift my control board out, the negative lead parted from it's crimp. Looks like the crimp was bad (although it had lasted 3 seasons!). After several days of scraping around to find a computer with a serial port (my moms) and borrowing a serial cable, I determined that while my Alltrax was still talking, it's output drivers had blown. It never again showed an errror code. There was nothing for it but to give up on using the boat during our holiday and order a new controller. This time I ordered two. I have no idea what actually caused the failure - the flyback diodes all checked - so it appears the negative lead coming loose 'spiked' the controller and caused the PIC CPU to crash and locked the output drivers full on and something in that circuit eventually burned out. A collegue that has extensive microcontroller experience doesn't like PIC micros - says they have a habit if locking up in poor power conditions - so maybe that's what happened to me. After yet another reversing contactor failure, I replaced the PWM Alltrax controller with a Kelly Controls KDZ series PM H-Bridge controller with the joystick reverse option. While I don't have any particular issue with the build quality and the combined throttle/reverse works well, there are some issues with this controller. - if you program a lower current limit into the controller, the meter is still scaled to the maxium capacity of the controller. I tried to bring up the final point with Kelly, as it could be dangerous, as full reverse on a boat is used as an emergency brake, but after telling me the joystick reverse option was intended for marine use, and offering a waterproofed version of the controller, they then tell me they won't fix the reversing delay as the controller is not intended for marine use!. While the controller does more or less work as advertised, and does have a pretty good price, some of these issues make it difficult to recommend for marine us.